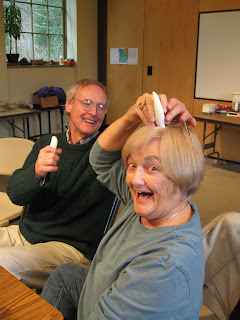 During Lee Post's week long visit volunteers practiced creating casts of Orca teeth. It will be necessary for us to create casts of the teeth once we receive our Orca skeleton. Because the natural Orca teeth have a root structure, and are not 100% Ivory, they do not fare well when left in place. We practiced replicating the teeth with a resin mixture. This resin sets within 20 minutes, turns white, is removed from the mold and is ready to be painted. We are exploring our options with plaster, resin and other mixtures. Maybe one day we will sell these casts in our gift shop! John and Katherine ...having a blast. The finished product looks very similiar to the real thing! Have you ever wondered what information we can learn about our oceans from satellites? If so, you are in for a treat! Click here to check out the 'Ocean Topography from Space Website'. The latest Jason-1 data reveals dominant cool ocean conditions in the Pacific Ocean. This site also provides a discussion on the terms "Global Warming" versus "Climate Change". Click here to check out an article about Dr. Sylvia Earle published by the New York Times on January 12, 2009. Dr. Earle is an oceanographer and former chief scientist of NOAA (National Oceanic Atmospheric Administration). She has dedicated her life to studying the marine environment and is an inspiration to us all! Dr. Earle co-authored "Ocean-An Illustrated Atlas" published by National Geographic. The Atlas has been described as "Detailing a mysterious realm that’s as vital to our existence as the air we breathe, this new atlas immerses readers in the wonders of the deep through more than 250 up-to-the-minute maps, photographs, and satellite images." (Amazon.com, 2009). I strongly encourage you to read this article and check out her photo album. In the last month or so we've had visitors ask, "So, what do you guys do when you're closed? Go on vacation?" Although it is true that we close both Natural History and Marine exhibits during the month of January, we spend the time working on a number of projects. One of which is happening this week! This Saturday, January 17th, from 1:00 to 4:00 pm, we will be hosting a free event called Bring Your Bones Day. This is a unique chance to bring any of those mysterious bones you have found -- perhaps while walking on the beach or in the woods -- to the Port Townsend Marine Science Center to have them identified by two bone experts. We will have Lee Post, a master marine mammal skeleton articulator, here from Homer, Alaska. Lee is also known as "The Boneman" and you can visit his website by clicking here. We will also have local veterinarian and wildlife specialist, Dr. Tony Rogstad. Combining the knowledge of The Boneman and Dr. Tony, I'm confident that you will discover the origins of any bone you bring to them. Even if you don't have your own bones, we will have our bone collection on display, including gray whale, seal, otter, dolphin, and bird skeletons. For more information about Bring Your Bones Day, click here or give us a call at 360.385.5582. Live Necropsy of Great White! I just received this email today and thought I would post it here for anyone interested in viewing a live necropsy! "Just what will be found inside the stomach of a great white shark--a seal...a penguin... a human hand?! Now you can find out live on the Internet! The Auckland Museum will be hosting a live necropsy of a large female great white and everyone is invited to watch on Wednesday from 5 pm to 7 pm EST (that's Thursday, January 8th 11am-1pm Auckland time). The shark was retrieved in the Kaipara Harbour on Monday last week, entangled and dead in a gill net. The fisherman notified the Department of Conservation Auckland Area staff who recovered the shark. The necropsy will be carried out by Clinton Duffy of the Department of Conservation Marine Conservation Section and Dr. Tom Trnski, Marine Curator of the Auckland Museum.³ This is a rare opportunity for people to get a close look at a Great White, and to see how scientists find out more about the complexities of the natural world through their research,² says Dr. Trnski.³ Little is known about the life history of these apex predators of the ocean, and we hope to learn more about the shark's recent past before it came into the harbour.² The operation will examine the shark's stomach contents, take measurements of internal organs, as well as investigating the gills and removing the jaws. Learn more at http://www.aucklandmuseum.com/Default.asp?t=913"
After cleaning our large wall tank during Home Crew today, Dan noticed that hundreds of Grunt Sculpins (Rhamphocottus richardsoni) were beginning to hatch! While the juvenile Grunt Sculpins have been hatching slowly for a few weeks now, today marked an important day for this mother who has been fanning her eggs for so long! Check out the video we took this morning! Soozie tried to siphon out most of the hatchlings but they continued to hatch after she finished. God speed young Grunt Sculpin babies. Make us proud.